With Vancouver real estate prices surging over the past few years homeowners are tapping into their equity (refinancing) at alarming rates. It’s important to understand refinancing and how CMHC quantifies refinancing. The big takeaway in this scenario is that homeowner mortgage balance had to increase by more than 10% to quantify as a refinance. As per the latest data from CMHC, Vancouver homeowner refinancing (drawing equity) increased 27% year over year. Vancouver homeowners refinancing their homes increased 27% year over year. 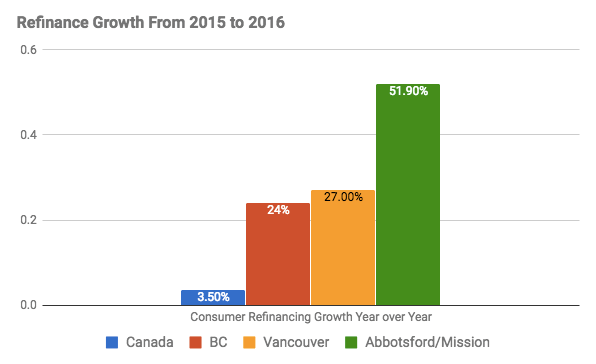 Perhaps even more alarming is the massive growth in consumer refinancing for Abbotsford/Mission. Home prices have surged in these generally lower income areas and with that homeowners are tapping into recently discovered wealth. This is what economists call ‘the wealth effect’. As home prices increase, homeowners feel wealthier, so they tend to borrow and spend more. This was the case in the United States during their housing boom, as researched in the Book ‘House of Debt‘ . From 2002-2006 low credit-score homeowners borrowed an average of $0.40 for every $1 increase in home equity value. Estimates show that over half of the increase in debt from 2002-2006 can be directly contributed to borrowing against the rise in home equity. Homeowners didn’t just extract home equity- they spent it. Many homeowners borrowed despite having substantial debt outstanding on their credit cards. So, while some Canadian consumers will take advantage of a lower interest rate, while possibly reducing their monthly mortgage payments, they will have ultimately increased their outstanding mortgage debt. And if Canadians are anything like their American neighbours, history suggests many homeowners won’t be using that equity to pay off outstanding debts. Expect an increase of shiny new boats, gas guzzling Ford F-150’s, and family vacations down south.